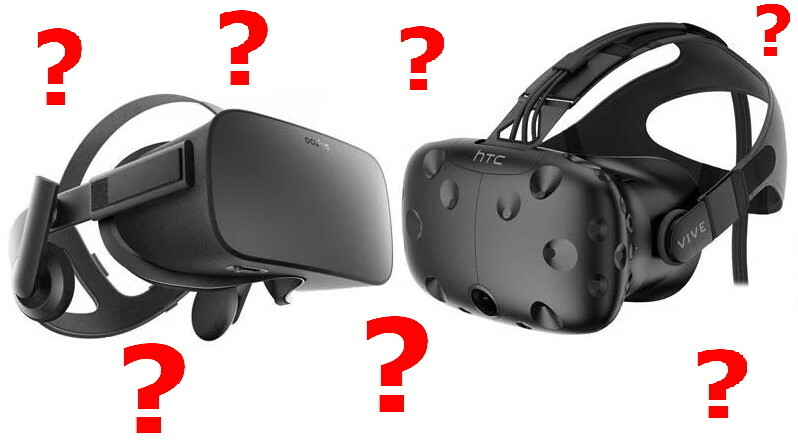 With the flurry of price drops from Oculus, it seems like this is a good topic to revisit. If you’ve read my blog before, you may know that in general, I prefer the Vive for my personal use and development. I do own an oculus rift and love it though. If you don’t own either though, deciding which to get can be confusing, with arguments from people on both sides about why one is better than the other. So here, instead of personal preferences, I’ll try to share the actual differences that I’ve experienced owning both for over a year. From the start, Oculus said their system was for seated experiences. Then it switched to standing, and eventually ‘full roomscale support’. The Vive on the other hand was designed from the ground up to work great with room scale setups. And make no mistake, there is a difference between the two. I’ve used the Rift with touch controllers for 100’s of hours, with 2 sensors and with 3. In general, it ‘works’, but it does have some drawbacks. Cables are SHORT, so if your PC isn’t in an ideal spot, you’ll need active USB extension cables (around $20 on monoprice.com). The HMD cables are short too.. I don’t know why, but there is definitely less slack with the Oculus cables. Mounting is harder. They’re not built for wall mounting first, so you need to get your own mounting solution OR put them on a flat surface where they won’t get bumped or moved. For my home setup, this is nearly impossible, but in the right office environment it’s not too bad. Tracking isn’t quite as good. It drops out occasionally (even with 3), but not often enough to be a huge deal. Lighthouse setup is simple if you have a screwdriver and a wall with power somewhere near. HMD cable is long, so long it sometimes hangs and gets tangled. It’s still much better to have a long cable though. Personally, I can’t tell any real difference between the two visually. My eyesight is good (20/10), and they both look about the same. I do notice the lenses a bit on them both, but neither bothers me. Here the Rift still wins out. Even with the deluxe audio strap, the rift is lighter and a bit more comfortable to wear. That’s not to say that the Vive is uncomfortable, but even a small weight difference can become noticeable if you wear it long enough (unless you happen to have giant neck muscles).. If you do go with the Vive though, the deluxe audio strap does help with weight distribution and comfort, especially for people like me with giant over-sized heads. With controllers, it’s kind of a toss up depending on the type of games you like to play. A lot of people love the Oculus controllers, for good reason. They’re pretty natural feeling and the touch detection is awesome. For games where your controller represents your hand, the touch controllers are hands down the best choice. When it comes to games where you hold a gun, paddle, bat, or something else though, I prefer the Vive wands. They just feel a bit more like I’m holding the actual object. And the new knuckles controllers look really promising, they could end up better than the touch controllers, but I can’t say for sure until I try them. In general the content for the two devices is very similar. Almost every game can be played across both devices, and there’s no killer game that would lead me to buy one over the other. While Cculus does have a few exclusives, there are ways around it, and they’re not enough to sway me. This is for the programmers and game devs. If you’re wondering how hard it is to build a game for one system or the other… it’s about the same. Both devices work great with SteamVR, though for the Rift, you do need to strip out SteamVR and use the native SDK. That’s the only real difference though. They are both a pleasure to develop for and I’d call this one a draw. This is something people often overlook. Both of these devices have the same GPU requirements, but they do differ on other requirements. The Rift requires 3-4 compatible USB 3.0 ports. I say compatible because many of the USB 3.0 ports I’ve tried on different systems do not work. In-fact there’s a list of compatible USB 3.0 addon cards that you can buy if your onboard ones won’t work. I’ve also had a few laptops that wouldn’t work with the Rift (USB compatibility or no video), while I’ve never had any problems with the Vive. The Vive does require a single USB 2.0 port though. It usually works fine in 3.0 ports too, but I have at least one system where the 3.0 ports are not compatible with the Vive. Luckily there are plenty of spare 2.0’s left. The massive shift in pricing is what drove me to re-consider my thoughts on this debate. If you haven’t seen it already, the Rift has had a price drop to $399 with touch controllers INCLUDED! That’s an amazing deal, and on prime day they even had a $100 amazon gift card included (looks like they killed that though). If you want to do roomscale with the Rift though, you’ll wanna include another $99 for a 3rd sensor (and spare controllers). The Vive also recently got a price drop to $599. On top of that, the deluxe audio strap is another $99, and knuckles controllers aren’t gonna be free either. But when you add in the cost of the 3rd sensor, they’re really not far apart anymore. It’s about a $100 difference, which in my book turns out to a Draw. Here, the winner is obvious, Oculus is way ahead. If you go through the differences above, you’ll see it’s pretty even. Rift wins in some places, the Vive wins in others. This may leave you wondering, which is right for me? First, make sure to check compatibility. If you only have a laptop, make sure that laptop has a GPU that can handle it, AND the USB 3.0 ports for the Rift. If you don’t have those ports, the Vive is definitely your choice. Next, think hard about room scale. Is it really important to you? Are you going to play most of your games sitting down on a controller or standing in place? How much room do you really have to play in? If room scale isn’t your thing, the Rift is an obvious winner. If you do have the room though, and really want to have experiences that span a bigger area, the Vive is a better choice. Of course the giant distance in pricing can also be a big factor. If you’re just looking at VR, and your system will work with the Rift, and money is a limited resource, take advantage of the Rift price drop and get started today.